As far as modern sets go, 1993 Topps Finest Baseball is one of the most recognizable. 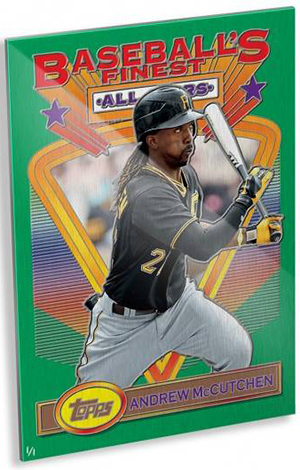 The design was revived for inserts in 2013 Topps Finest. Now it's being brought back again for a series of online-exclusive metal prints. 2015 Topps 1993 Finest Metal Wall Art features 80 players. Most are current veterans. 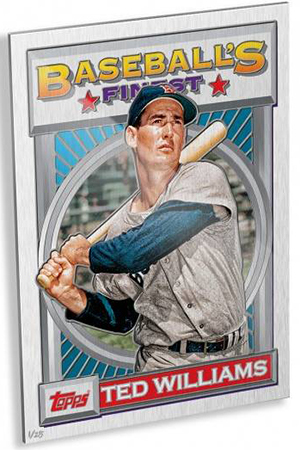 A handful of all-time greats appear in the product as well, most of whom have never appeared on something with the set's design. Available only on the Topps website, each of the prints has two versions. Basic versions are numbered to 25. Gold versions are all one-of-a-kind. 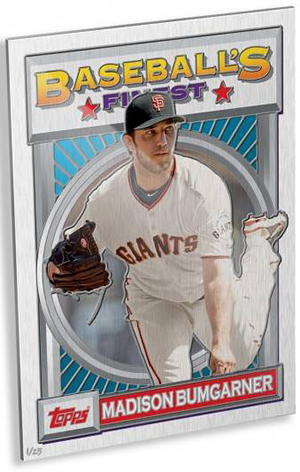 Each piece of 2015 Topps 1993 Finest Metal Wall Art measures 10 by 14 inches. They're printed on heavy-duty polished aluminum and come with a wall mount. Sticking with the original 1993 Topps Finest set, there are two designs. Most players have a basic framed look. A handful are done in the style of the All-Stars subset. Regular versions cost $99.99 while their Gold counterparts are $199.99.